The new European launch vehicle Ariane 6 is to embark on its maiden flight from the Kourou space center in French Guiana in July of 2020. Top image is what the launch facility for the ARIANE 6 will look like when the new launch vehicle embarks on its maiden flight. Photo is courtesy of CNES. Bottom left photo is of the launch table for the Ariane 6 during factory acceptance testing at the close of November 2017. Photo is courtesy of ESA.DONGES StellTec. 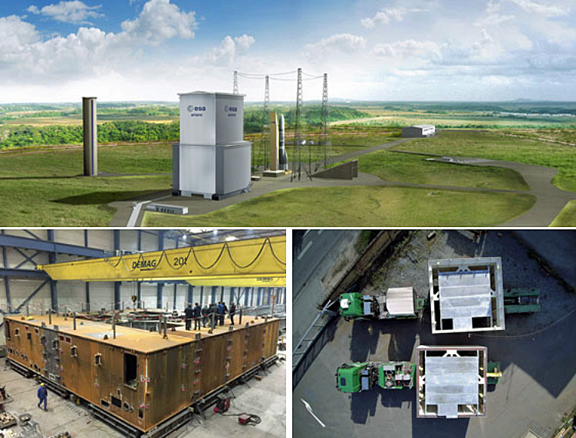 Bottom right photo is of the transportion of the initial parts of the umbilical tower for shipment to Kourou. Photo is courtesy of MT Aerospace AG. MT Aerospace AG and its Mainz-based subsidiary, MT Mechatronics GmbH, are constructing the mechanical launch facilities (ELA 4) in the Amazon region in a contract for the French space agency CNES. With the successful completion of the critical design review at the end of November, Europe has come one important step closer to completing the ground facilities for the new launch vehicle. Composed of representatives from the European Space Agency (ESA), ArianeGroup, CNES, Apave and Socotec, the review board approved the detailed design for the launch facilities submitted by MT Aerospace and MT Mechatronics and gave the go-ahead for construction to commence in Kourou. The contract covers the 650 ton launch pad with the mobile pallet systems used to bring the solid-rocket booster to the launching site as well as the umbilical tower with a height of roughly 66 meters and the exhaust gas deflector. The launch table is ready and completed and has passed acceptance testing at the plant last week and this unit will be transported to the spaceport in early 2018. The first parts of the supply tower are already on the way to Kourou. MT Aerospace is as main contractor with a 10 percent work share and is mainly responsible for the fuel tanks and metallic structural components of the ARIANE 6. In addition, MT Aerospace and MT Mechatronics have been closely involved in the construction of all launch facilities for the six ARIANE generations as well as the SOYUZ launcher at the space center in Kourou for over 40 years.